In an industry where every hour’s outage time means loss of profitable production, investing in a Brokk can pay back after the very first kiln tearout. Easy and early access, maximum maintenance efficiency and operator safety, Brokks means new, concrete advantages. Demolishing coating and brick linings is a perfect job for the Brokk machine. There’s simply no faster or safer method. The compact design makes access easy, while the remote control makes the work safe and quick. Efficiency is enhanced by the fact that the operator can choose the best position to perform and monitor the work, and not not have to worry about vibrations, fumes or the risk of collapsing material or hot coating. With excellent stability in all directions and easily adjustable breaker frequency, the Brokk ensures precise operation without shell or lining damage. The three-part arm system provides flexibility and reach and allows for less repositioning of the machine compared to conventional excavators. Since the Brokk is heat resistant with well-protected cylinders and components, you can start the job earlier without risking breakdown due to heat. This reduces plant downtime and increases the plant profit. Reduces plant shut down time and thus increases profit. 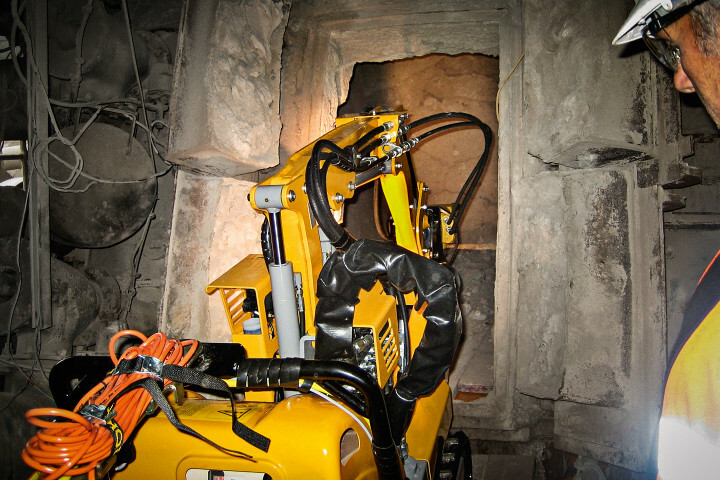 Demolition robot Brokk 90 is successfully demolishing a cement kiln in Sweden.